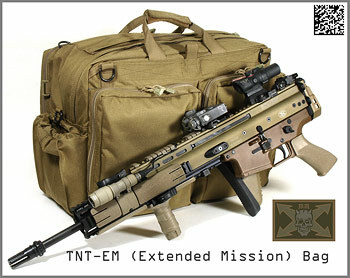 10/20/08 - I'm proud to introduce my latest collaboration with EMDOM USA, the TNT (Tactical/Non-Tactical) Bag. The TNT project started back in mid 2007, when I expressed my desire to Ken at EMDOM to design a bag that is practical enough for EDC (Every Day Carry) use, doesn't look overtly 'tactical', but still has some gun-friendly/tactical features concealed internally. I have seen most of the 'messenger/Spartan/tactical man-purse, patrol, tactical briefcase, bail-out bags' out there; and there are some very good designs to fit a variety of needs. But, none of them were matched exactly what I had in mind, so I set about thinking and sketching up a design. Over the next few months, Ken and I exchanged numerous drawings, diagrams, emails and phone calls, and went through three prototypes to arrive at the production version. As usual, I was very impressed with the way EMDOM's prototype/pattern maker was able to translate drawings into a finished product and figure out how to fabricate the more challenging features in the most elegant way possible. Design philosophy - I envisioned a shoulder-carry bag. A shoulder carried bag is easy to access and stable enough if a waist strap is provided. I didn't want a messenger bag style flap. Flaps get in the way if you're trying to access the contents of the bag. I wanted everything to be relatively easy to access when the bag is being worn (that's the whole point, I think). The bag also had to be stiff enough to have some shape when loaded up, and not act like a floppy duffle bag. Just like a backpack, the heavier the load, the more support is needed. This bag would need a stiffening sheet and be padded vs. an unpadded fabric-only soft bag. Padding would also provide protection for the contents and make it more comfortable when wearing the bag against the body when it's banging around. I decided against MOLLE/PALS, inside or outside. I wanted the bag to look relatively non-descript, and not stand out in a crowd as something unusual that might attract attention. MOLLE webbing on the outside shouts 'tactical', and while I like modularity, and the ability to customize the inside of the bag with MOLLE-compatible pouches, I feel that most MOLLE pouches and the attachment method takes up too much space and is too bulky for inside use, especially for a bag of this size. 1000D pouches are overkill for internal organization. That's additional weight to carry. Most pouches are not designed to be used internally and can be difficult to access unless the bag opens out flat. One of the issues with bags that open out flat is that the zippers can open up too much if you're opening the bag while wearing it and the weight of the contents can end up opening the bag all the way. With the TNT, the main compartment zippers only opens until about a third of the way down the side of the bag and won't open up accidentally. You can run the TNT with the main compartment zippers completely open without fear of the bag opening like a book. The gear needs to be organized inside a bag, not necessarily retained with a velcro flap and SR buckle. I decided to try and design a universal and effective layout of internal and external organization that should fit many needs, so the bag is good to go and is ready to load up from the start, without having to buy an additional $80 worth of pouches to organize your gear. I also wanted to avoid too many individual small pockets on the outside that looked busy. It was also important that all the features or compartments were easy and convenient to access, whether the bag was being worn or not. I'm fortunate to have a wide array of bags to examine, which helped me determine what size would be most practical. It couldn't be too small, so it could carry a binder or two, papers/magazines or some medium sized laptops (up to a 15.4" screen), but not too large since it's an over-the-shoulder bag. Even a relatively small bag can be quite heavy when loaded up with a pistol and ammo, plus rifle magazines. The first prototype was actually too small, and we increased the size by an inch in all dimensions which provided more usable space inside the main compartment. What we ended up with is a medium-sized shoulder bag, sort of in-between a messenger bag and tactical briefcase, which I think is just about the right size to be very practical for regular, every day use. It's not overtly 'tactical', yet it has features incorporated into the design which also make it a bag for fighting out of - suitable for concealed weapons carry and rifle magazines, which is where I came up with the 'TNT (Tactical/Non-Tactical)' name - it serves both functions. Internal pockets will have contrasting 420D nylon. Everything else is the same - the SDU Grey represents the final production TNT bag. The Coyote prototype is shown here for illustrative purposes only. 1000D Cordura construction, YKK zippers and mil-spec velcro. Total volume approx 1600 c.i. (main compartment and external pockets). The TNT is the first EMDOM item to be offered in SDU Grey. EMDOM's manufacturing partner in Hong Kong makes nylon gear for Hong Kong's Special Duties Unit (SDU) in a special grey nylon, so since they had it in stock, I figured it'd be a great non-descript colour for the TNT. It's a medium grey and matches foliage green hardware and webbing very well. The TNT is also available in EMDOM's standard colours: Crye MultiCam, Sewer Green (OD), Coyoteish (Coyote), and Black. Some people have asked "will you make it other colours like Navy Blue or ACU?". Not at this time, as EMDOM does not carry those fabrics. All internal edges are finished and seam taped. You will not see any exposed edges of material that will fray. The quality and attention to detail that EMDOM puts into their products will match or exceed any other top of the line tactical gear manufacturer, which is why I chose to work with them. Compare them inside and out, and judge for yourself. Approx overall dimensions: 18" wide x 12" tall x 6" deep. Overall Features and Dimensions - Externally, the TNT bag body measures approximately 15" long x 12" tall x 5.5" deep (not including external pockets). Subtract about a half inch from those dimensions for the main compartment internal dimensions to allow for padding. It has one main compartment, padded on both sides and the bottom with internal organization, two front pockets, a front pistol compartment, rear newspaper/magazine compartment, a top frequent access compartment, and two side stash pockets. 4" x 3" loop velcro fields are provided on the front two pockets for ID, patches etc. The design, sizing and dimensions for the pockets and internal organization were based on multiples of the M4/AR-15 30-round magazine, as you'll see below. The TNT is constructed completely of 1000D cordura with 420D used for internal organization. ITW ghillietex metal and plastic hardware is used throughout, as well as YKK zippers and mil-spec velcro (the good stuff). EMDOM customers should already be familiar with EMDOM's bomb-proof construction, quality of workmanship, and attention to detail. Shoulder strap -The TNT comes with a padded, Drilex lined shoulder strap with one HK snap hook. The TNT shoulder strap is designed to remain attached to the bag, and stowed in the newspaper compartment when not in use. The HK snap hook allows the front of the strap to be released relatively quickly, but not so easily that someone else can do it. We chose not to make an SR buckle on the shoulder strap a standard feature for EDC in public because an SR buckle on the main strap can make it very easy for someone else to release the bag and run off with it. For users in the military, where this might be less of an issue, or if someone wants a emergency release feature on the shoulder strap, a split-bar/field repair ITW SR buckle (not included) can be installed on the D-ring loop as shown below. It's a tight fit, but it works. The 18"-long padded portion is 2" wide and the straps are 1" webbing with dual ITW ghillietex metal bar sliders. It's more comfortable than webbing-only straps, and with the fixed pad, there's no separate pad to slip and slide on the strap. It's also more low profile than most padded shoulder straps. I found that there was no reason to have 2" wide webbing for the entire strap - the 1" webbing gets in the way less and with over 1500 lbs of breaking strength, it's more than strong enough. We experimented with different padding options for the padded portion, and found that adding more padding didn't make it more comfortable. If you chose to, you can add any removable shoulder pad designed for 2" wide straps from other manufacturers. However, try it and you'll see that it might not be more comfortable. More padding also meant more bulk when you stow or fold the shoulder strap away inside the TNT. Normally, there is no need to attach and detach the shoulder strap as it is stowable without removing it. There are four metal D-ring attach points, giving the user a choice - two on the rear and two on the front. Attaching the shoulder strap to the rear D-rings allows the bag to sit against the body better than if they were attached to the sides/middle of the bag. This allows complete access to the main compartment without the compartment being pressed against the body and compressed. The rear panel of the TNT is padded and quilted, for comfort and to provide some 'purchase' when wearing it snug with a waist belt. The carry handles are 1.5" webbing, and are short for the lowest profile possible. There is a padded velcro handle wrap for connecting the carry handles together if desired. A removable waist strap is also included. This is 1" webbing with a SR buckle, and attaches to the TNT body with metal bar sliders that route through 1" tab loops on the body. The waist strap stows when not in use, and need not be removed under normal use. Side Stash Pockets - There are two Side Stash Pockets, one on each side of the TNT body. They are 9" tall and are of a unique pleated design which allow them to lay somewhat flattened when not in use for a lower profile, yet expand away from the bag body when needed. When expanded, they add about 3" to each side of the bag. The Side Stash Pockets are designed for multiple uses, like quick stowing of items - almost like a mini dump pouch. They have an elastic shock cord closure with a sewn-in ITW cord lock for one-handed tightening. I wanted them to be large enough to be useful, and not intrude on the internal capacity of the main compartment, which is where the pleat comes into play. They're sized to hold a Nalgene bottle securely. If you look at the side profile, you'll notice that the outer edge of the pocket angles up, and is taller than where it attaches to the bag body. This is so that it wraps over the shoulder of the bottle, preventing it from slipping or popping out. It will also fit USGI 1-qt canteens, four 30-round M4 mags, or three .308 FAL/M1A mags. I've illustrated it below with four Magpul PMags with Ranger pulls. The shock cord loop can also be put over the neck of a bottle for extra retention, although when cinched up, the contents are very secure. Inside the Side Stash Pockets are two additional tab loops, for dummy cords or adding another loop of shock cord for retention of radios (stick it over the antenna). Top Frequent Access Compartment (FAC) - Whatever bag I carry, I always find myself wishing there was a small compartment for keys or frequently accessed items that was easy to get to, not buried inside the main compartment. The solution? The top Frequent Access Compartment (FAC). The FAC is sewn to the top panel of the TNT bag, and is a long, flat zippered pocket with two internal dividers, creating three compartments. Each compartment is 4" long and 3" deep, and can hold items like keys, a small folding knife or multitool, pack of gum, etc. The FAC is sized as large as allowed by the dimensions of the bag. Making it larger would require an increase in size of the bag. I've illustrated the FAC with a Leatherman Wave, a Petzl E-Lite, and my cell phone in the separate compartments. Great for storing business cards as well. That's where I put my keys so I can get to them conveniently. The zipper is concealed with a rain flap and only the cord zipper pull shows. Note that the compartments are not completely separated from each other - there's about an inch where the partitions stop short of the zipper. So, small loose items things like coins or single keys might migrate from one compartment to the other. Pistol Compartment - One of the common features of many Tactical bags is a pistol compartment. The TNT is no different. The pistol compartment of the TNT is at the front of the bag, kept closed by velcro, and accessed by ripping open the pull tab. There is no velcro at the tab, so you can get your thumb behind it to aid in pulling it apart. It's not difficult to open, but secure when closed as 1.5" velcro instead of 1" is used. It will accommodate most full-sized handguns. I experimented with the pistol compartment at the rear of the bag, but access wasn't as quick or as easy, with the full weight of the bag pressing up against your body and the compartment. A front compartment is easier to access. It's not a completely concealed 'secret' compartment, but it's not too obvious either. The inside back panel face is lined completely with loop velcro, for the attachment of any velcro accessories (other brands/maker's stuff will work, too). The TNT is supplied with a pistol holder and an elastic mag/accessory holder. The pistol holder is completely adjustable, and designed such that one of the velcro bases can fold under the pistol, so that the pistol can be located closer to one end of the compartment or the other. The mag holder has four elastic loops, which is the maximum there's space for in the compartment. It'll hold 1911 single stack or most other double stack pistol magazines. Magazines with long floor plates should be loaded so that they overlap for easier retrieval. You can also put flashlights in the loops, but there's no real point to concealing a flashlight. The mag holder can also be placed overlapping one of the pistol holder bases to save space. To support the weight of a handgun and mags, the back panel is stiffened with a sheet of HDPE. This ensures that the panel will not sag under the weight, and also serves to provide support and shape for the entire bag. The HDPE stiffener also supports the mesh pockets in the main compartment. Rear Newspaper compartment - The rear newspaper compartment panel is lightly padded, both for comfort and for shape. It's meant for paper magazines, a folded newspaper, notebook etc - any large, flat item essentially. It's kept closed by a velcro patch in the middle for quick closing and a snap for added security if desired. It's also designed to stow the waist strap and shoulder straps, and the carry handle, depending on which ones are not in use. If you look at the photos below, you'll see how the waist and shoulder strap attach points are located to facilitate their stowage in the newspaper compartment without having to detach them. If the bag is being worn over the shoulder, and you want the carry handles out of the way, you can stow the rear handle in the newspaper compartment and the front handle in the pistol compartment, for a 'slick' top. Main Compartment - The main compartment two-way zipper opens down to the top of the Side Stash Pockets and are protected by a rain flap. The main compartment opening is more towards the front of the bag instead of in the middle. During experimentation, we found that when the opening was too close to the body, it was more difficult to access the contents. The offset zipper also makes room for the top Frequent Access Compartment. The main compartment is protected by closed cell foam on the bottom and sides, slightly thinner padding on the rear panel, and the HDPE sheet in the front panel. The main compartment will fit most laptops up to 15.4" screens. Slot Pockets - Sewn to the inside rear panel are four bellows slot pockets made out of 420D cordura with elastic retention. These slot pockets fold flat out of the way when empty. Each slot pocket is 6" tall and is sized to fit two M4 30-round magazines or one .308 magazine. Whatever fits in a double M4 pouch will fit in these pockets. They can be also used for radios, PDAs, etc. The elastic on the outside of the slot pockets can be used to retain flashlights etc. The advantage that these have over magazine pouches attached to internal molle inside a bag is that besides being lighter and less bulky, there isn't any flap to contend with. You can have the zipper partially open, reach inside, and pull mags out with ease, just by feel. Mesh Pockets - On the inside of the front panel are three mesh pockets. The one on the left is a full 12" tall, and the ones on the right are 6" in height each. All are 7" wide. The mesh is sewn baggy so that the pockets are not flat, but have volume to hold more items. Each has a zipper opening with short pull. When empty, the mesh pockets lay flat and don't take up any internal volume. Of course, adding items in the slot and mesh pockets takes up internal volume, but with the slot pockets flat, I'm able to put a couple of three-ring binders inside, with some room to spare. Front Organizer Pockets - One feature I look for in an every day use bag is good organization for smaller items in the pockets. I dislike having a couple of large pockets with everything in a mess at the bottom. There are two pockets on the front of the TNT bag, each with slightly different organization inside. Each pocket is 10" tall, 7" wide, and 2" deep. Both have two-way zippers which open 3/4 of the way down. This allows the pockets to open outwards almost completely but not all the way and have items fall out. The internal organizers are made of 420D nylon. Inside the front of each pocket are two staggered slot pockets. The taller one will fit a couple of DVD cases and the shorter one will fit CD cases. The tall slot pocket also fits two M4 30 round mags side by side and the short one fits two .308 magazines (since they're shorter). As mentioned before, the sizing of the main pockets on the TNT bag are sized to fit multiples of M4 mags. Eight in the main compartment slot pockets, four in the front pockets, and four in each Side Stash Pocket. So, you can carry at least twenty 30-round mags in just the pockets alone, with room left over in the main compartment. Looking at the front of the bag, the pocket on the left has a main slot pocket for PDA, notebooks etc, and sewn to its front is a slot for business cards, and three oversize pen loop. I was tired of puny pen loops that were too tight, so asked for larger ones that would accommodate Sharpies, markers etc. Inside the right front pocket are two staggered slot pockets with elastic strap retention. The slots in the back are flat, and suitable for additional business cards. The pockets in front are pleated, and will expand to hold most cell phones for 'non-tactical' use. For 'tactical' use, they'll also fit distraction devices - I've shown them below with two dummy Def-tec #25s. Hidden Passport Pockets - Underneath each of the two front pockets is a secret/concealed 'passport pocket'. They're basically for putting flat items like documents or maps that you don't want found if the bag is subjected to a cursory visual search. I say 'cursory' to be on the conservative side, but no one I have let examine the TNT bag in detail has ever noticed those compartments. But then, they weren't looking for something hidden. The openings to both pockets are velcro closed, and in between the front pockets. Under normal circumstances, the entrance is not visible. Through my collaborations with EMDOM, we refined the design of the TNT based on my daily use of the prototypes since late 2007, and I think we've come up with a very practical size and design that's quite universal. Tactical and non-tactical users alike will find good use for the features and organization. The TNT is designed around function first, looks second; and is intentionally non-descript. Every Day Carry (EDC) - I've been using it for EDC on my shoulder while riding my motorcycle and the waist belt keeps it in place and behind me, when adjusted correctly. Since I'm left handed, I prefer to wear the TNT on my left side/hip so everything is easily accessible with the strong hand. In Coyote and SDU Grey, the TNT doesn't stand out as too 'tactical', and no one has really given it a second glance that I know of in public. Crye MultiCam (or any camo) probably stands out a bit around town, but the TNT sure does look damn good in MultiCam. Fighting Bag - Depending on what you consider a 'fighting bag', the TNT might be on the large side if you're only intending on carrying a few mags, pistol, etc. It's not designed primarily as a small dynamic movement fighting bag - there are lots of smaller bags on the market that will suit that purpose. The TNT is designed as a more all-round bag that can be used to fight out of, if needed, that carries more than just mags. Fighting and combat is something I know nothing about as I'm just a civvie, but I did my best to design features into the TNT that could be used by people who go in harms way. Here are my thoughts anyway. If you're going to 'fight out of the bag', and use it primarily for reloads, the TNT might be better worn on the 'weak' side. There's not much you can do about having the pistol and spare mags on the same side, but the way I look at it, you're going to access the pistol once, and the mags four more times. You can always draw with your weak hand. I tried the TNT on the weak side, and with the main compartment zipper open, you have 8 rifle mags right there, which are quickly retrieved for a reload. If mags need to be retained, the main compartment can be used as a big dump pouch. The waist strap is really essential if you're going to be running around with the TNT. No, it's not going to make the TNT rock solid on your hip when it's loaded up, but it really does help keep it where you want it. Shortening the shoulder strap to wear it a bit higher also reduces movement of the bag on the jog. Obviously, a shoulder bag will not be as balanced and stable as a pack worn on your back during movement. But try reloading from a pack on your back. Small Range Bag - Though I didn't design the TNT for use as a range bag, I found that it actually works pretty well as a small/compact bag to support one or two handguns, or one handgun and a rifle. The handgun can be transported along with its mags in the pistol compartment, and you can carry a bunch of M4 mags inside and outside the TNT. With a water bottle in one of the Side Stash pockets, and 12 mags in the slot pockets and other Side Stash pocket, additional ammo fits in the main compartment along with my EMDOM Kitmat, spare parts and tools. It makes a great 're-supply' bag for a tactical class, with mags, ammo, food and water near the firing line instead of going back to your larger gear bag that you brought everything else in. The TNT is a complex and labour-intensive bag to make with all the internal organization built in (it takes a full 8 hours to produce one TNT). If you add up the cost of buying the equivalent molle pouches plus the added weight and bulk, you'll see that the TNT offers the least costly and streamlined way to carry and organize all that stuff. It's not a cheap bag, but it isn't overpriced. People will shell out the same amount of money for a rail system for their rifle and even more for a decent optic without hesitation, but go cheap on a nylon bag they'll use every single day. It's completely biased of me to say "the TNT works perfectly for my needs" because I designed it specifically with those needs in mind. But it really does work as I imagined it would, thanks to the help and hard work by EMDOM to make it into a reality. Hope you find it as useful and practical as much as I do - thanks for looking. For ordering info and a ton of other photos, visit EMDOM USA's TNT Bag page. 2/1/11 - The EMDOM USA/MM TNT-EM (Extended Mission) Bag is a larger version of the TNT Bag with a host of added features, and was developed by request of a U.S. Army unit that needed an overnight courier-type bag with the same features as the original TNT bag, only larger and with some specific requirements. The overall size of the bag has been increased from approximately 21” x 12” x 6” to 24” x 13” x 10” with side pockets expanded, making it perfect for longer trips instead of just EDC. It has been in use for about a year and a half with the original customer and EMDOM is now offering it to the public. Design philosophy/background - The design of the TNT-EM follows that of the original TNT, so please read the original TNT Bag writeup above for more design intention details. Everything is relatively easy to access when the bag is being worn and the bag is also stiff enough to have some shape when loaded up, and not act like a floppy duffle bag. The internal and external layout and organization should fit many needs, so the bag is good to go and is ready to load up from the start, without having to buy additional pouches or accessories to organize your gear. Ever since we introduced the original TNT Bag, I've received emails asking when a smaller or larger version would come out. The TNT size was carefully thought out to make it practical for every day use. I felt that a smaller bag would have limited carrying capacity and a larger bag was more of a travel bag than EDC. The number of requests for smaller or larger versions were about equal, so that meant (to me) that the original TNT size was just about right. New product development takes time and effort, and there were a lot of other projects going on at the time so we didn't pursue it. Given some very specific requests (and a paying customer), Ken and I discussed it, and started working on the upsized TNT that eventually became the TNT-EM. We came up with some design changes, and the first prototype was made two months later. Make the rear laptop compartment able to unzip completely and open out flat with the laptop secured to the folded-out panel. This is so that the laptop can pass through the X-ray machine without removing the laptop (allowed at certain airports). Also add another vertical strap so the laptop compartment can also be used as a garment bag for a sports coat etc. The request was incorporated into the second prototype, shown below, compared to the original TNT Bag for size. The TNT-EMs were shipped in November 2009 to a very happy customer. In October 2010, the customer contacted us again, who had been very satisfied with the TNT-EM, living out of the bag daily over the past 10 months. The only additional request was for us to look into a way of carrying it 'back pack' style, as carrying it over one shoulder can become unwieldy in the aisles of commuter planes. This new feature has just been incorporated into the TNT-EM that EMDOM is now offered for sale. As its name implies –"TNT" (Tactical/Non-Tactical), the TNT-EM Bag looks common enough to be used as an every day travel/carry bag, yet is designed with special features that make it suitable for tactical use. Over a year in R&D and prototyping, the dimensions and features have been thoroughly tested and refined to ensure that the TNT-EM works as intended. The whole system consists of the TNT Extended Mission Bag, a new detachable shoulder strap, two low profile detachable backpack shoulder straps, and a detachable waist strap. 1000D Cordura construction, YKK zippers and mil-spec velcro. The TNT-EM is also available in EMDOM's standard colours: Crye MultiCam, Sewer Green (OD), Coyoteish (Coyote), SDU Brey and Black. All internal edges are finished and seam taped. You will not see any exposed edges of material that will fray. The quality and attention to detail that EMDOM puts into their products will match or exceed any other top of the line tactical gear manufacturer. Compare them inside and out, and judge for yourself. ITW Ghillietex metal and plastic IR hardware. Steel HK snap spring hooks. Main compartment estimated volume 1400 cu.in. (stuffs out when loaded), protected or padded on the bottom and four sides. Main compartment approximate internal dimensions 17.5" x 12" x 6". Four folding slot pockets in main compartment to hold 8 M4 mags, flash bangs, or other similarly sized items. Elastic retention can be used to hold shall items like light sticks, flashlights or shears. Two pleated/low profile Side Stash pockets (170 c.i. each) with contoured opening for bottle retention, elastic shock cord closure, internal dummy cord tabs. Sized for Nalgene bottles, USGI canteens or five M4 mags (it can actually fit six, but it's a tight fit). They can also be used as dump pouches. Drilex lined, more heavily padded stowable/removable shoulder strap. Shoulder strap now has instant length adjustment with Gunslinger-style Z-pull. Stowable/removable waist strap with 1" ITW side-release buckle. New rear padded laptop compartment measuring 17" x 12" x 2" with dual vertical retention straps for laptop, jacket, flat items. Top zippered Frequent Access Compartment for small items with divisions. Larger size now fits larger phones and PDAs. Low profile/stowable carry handles with padded wrap. Velcro lined, quick access pistol compartment with adjustable pistol holder and two elastic magazine holders. HDPE stiffener sheet to support weight of pistol. Two large front organizer pockets (180 c.i. each) with internal 420D nylon organizers for phones, PDAs, pens, CD/DVDs. magazines etc. Four metal D-rings - one at each corner, and two additional ones at the sides to provide six attachment points for the shoulder strap. Two low profile webbing backpack straps (detachable), which allow the user to carry the TNT-EM vertically on the back. Contrasting colour for internal 420D nylon internal pockets and TNT-EM bag for easier visualization (for the darker colours). Approx maximum overall dimensions with side stash pockets and front pockets stuffed: 24" wide x 12" or 13" tall x 10" deep. Not stuffing out the side stash pockets reduces the overall length to about 18". Depending on how 'stuffed out' it is, it will meet United Airline's carry on dimensions of 22" x 14" x 9". Note that my prototypes seen here do not have any velcro on the front pockets. The production version has velcro patches. If desired, they can be removed with a seam ripper or X-acto (carefully). Overall Features and Dimensions - Externally, the TNT-EM bag body measures approximately 17.5" long x 12" tall x 6.5" deep (not including external pockets). It has one main compartment, padded on both sides and the bottom with internal organization, two front pockets, a front pistol compartment, rear padded laptop compartment, a top frequent access compartment, and two side stash pockets. The TNT is constructed completely of 1000D cordura with 420D used for internal organization. ITW ghillietex metal and plastic hardware is used throughout, as well as YKK zippers and mil-spec velcro. EMDOM customers should already be familiar with EMDOM's bomb-proof construction, quality of workmanship, and attention to detail. Side Stash Pockets - There are two Side Stash Pockets, one on each side of the TNT-EM body. They are essentially the same as on the original TNT, only wider. They are 9" tall and are of a unique pleated design which allow them to lay somewhat flattened when not in use for a lower profile, yet expand away from the bag body when needed. When expanded, they add about 2-3" to each side of the bag. The Side Stash Pockets are designed for multiple uses, like quick stowing of items - almost like a mini dump pouch. They have an elastic shock cord closure with a sewn-in ITW cord lock for one-handed tightening. Note that since they do not close completely, care must be taken to ensure that no small, loose items are placed in there when the TNT-EM is worn vertically, or the items may fall out. When full, they do not intrude on the internal capacity of the main compartment, which is where the pleat comes into play. They're sized to hold a Nalgene bottle, two regular commercial water bottles, or a USGI canteen securely. If you look at the side profile, you'll notice that the outer edge of the pocket angles up, and is taller than where it attaches to the bag body. This is so that it wraps over the shoulder of the bottle, preventing it from slipping or popping out. It will also fit five 30-round M4 mags (Pmag or TangoDown) comfortably or six stuffed tight. It can hold five .308 FAL/M1A mags. I've illustrated it below with five 30-round M4 mags. The shock cord loop can also be put over the neck of a bottle for extra retention, although when cinched up, the the bottle is very secure. Inside the Side Stash Pockets are two additional tab loops, for dummy cords or adding another loop of shock cord for retention of radios (stick it over the antenna). In the center is an additional D-ring for attaching the shoulder strap. Top Frequent Access Compartment (FAC) - The top Frequent Access Compartment (FAC) is one of the most popular features of the original TNT bag, and on the TNT-EM, has been increased in size since the bag itself is larger. The FAC is sewn to the top panel of the TNT bag, and is a long, flat zippered pocket with two internal dividers, creating three compartments. On the TNT-EM, there are two 4" x 4" compartments and one larger 4" x 6" compartment that wil hold larger smart phones and PDAs. The zipper is concealed with a rain flap and only the cord zipper pull shows. Note that the compartments are not completely separated from each other - there's about an inch where the partitions stop short of the zipper. So, small loose items things like coins or single keys might migrate from one compartment to the other. Pistol Compartment - The pistol compartment on the TNT-EM is taller and wider than that of the original TNT. The pistol compartment of the TNT is at the front of the bag, kept closed by velcro, and accessed by ripping open the pull tab. There is no velcro at the tab, so you can get your thumb behind it to aid in pulling it apart. It's not difficult to open, but secure when closed as 1.5" velcro instead of 1" is used. The TNT-EM compartment will accommodate all full-sized handguns. It's actually large enough to hold two handgunds if two holders are used. When designing the original TNT, we experimented with the pistol compartment at the rear of the bag, but access wasn't as quick or as easy, with the full weight of the bag pressing up against your body and the compartment. A front compartment is easier to access. It's not a completely concealed 'secret' compartment, but it's not too obvious either. The inside back panel face is lined completely with loop velcro, for the attachment of any velcro accessories (other brands/maker's stuff will work, too). The TNT is supplied with a pistol holder and two elastic mag/accessory holders. The pistol holder is completely adjustable, and designed such that one of the velcro bases can fold under the pistol, so that the pistol can be located closer to one end of the compartment or the other. The mag holder has four elastic loops. It'll hold 1911 single stack or most other double stack pistol magazines. Magazines with long floor plates should be loaded so that they overlap for easier retrieval. You can also put flashlights in the loops, but there's no real point to concealing a flashlight. The mag holder can also be placed overlapping one of the pistol holder bases to save space. Rear Laptop compartment - This 17" x 12" x 2" compartment replaces the rear newspaper compartment on the original TNT Bag. It was designed to hold a 17" laptop by request of the original customer. The intent is to allow a laptop to be secured to the panel, and opened out flat, so that the laptop does not have to be removed from the bag to pass through the X-ray machine at some airports. The compartment will hold a standard 17" screen laptop. I've pictured it with a large one below that measures 15.5" x 11.75" x 2" and there's still some wiggle room. The quilted, padded panel opens out flat. Note that there is padding on the bottom and rear panel - not on the sides and top where the zipper is. There are two vertical straps - one on the bag side, and one on the panel. There is adequate velcro overlap to secure flat items as well as those with some thickness or bulk. While it's designed for a laptop, it can also be used for paper magazines, a folded newspaper, or any large, flat item. The straps will also keep folded clothes in place. Main Compartment - The main compartment has the approximate internal dimensions of 17.5" x 12" x 6" (seam to seam) and is 1.5" deeper than the original TNT Bag. Since it's fabric, it can expand in width to accomodate a wider item. The main compartment two-way zipper opens down to the top of the Side Stash Pockets and are protected by a rain flap. The main compartment opening is more towards the front of the bag instead of in the middle. During experimentation, we found that when the opening was too close to the body, it was more difficult to access the contents. The offset zipper also makes room for the top Frequent Access Compartment. The main compartment is protected by closed cell foam on the bottom and sides, the padding on the rear panel, and the HDPE sheet in the front panel. The main compartment will fit most laptops up to 17" screens. The increased width/depth of the main compartment on the TNT-EM really makes quite a big difference in what you can stuff in there. The wider opening also makes accessing the internal mesh pockets easier. Just for illustration, I was able to cram a pair of size 9 Lowa boots in the main compartment, even though side by side, they're wider than the 6" seam-seam dimension. I also show a metal PVS-14 case below, which is like a tall ammo can, and measures 13" tall x 11.5" wide x 6" deep. The case will fit in the main compartment both standing up or on its side, even though it's taller than the 12" internal dimension. This is because the bag is flexible and can conform to larger items than its seam-seam dimensions. Slot Pockets - Sewn to the inside rear panel are the same four bellows slot pockets made out of 420D cordura with elastic retention as found in the TNT bag. They have not been changed, and fold flat out of the way when empty. Each slot pocket is 6" tall and is sized to fit two M4 30-round magazines or one .308 magazine. Whatever fits in a double M4 pouch will fit in these pockets. They can be also used for radios, PDAs, etc. The elastic on the outside of the slot pockets can be used to retain flashlights etc. The advantage that these have over magazine pouches attached to internal molle inside a bag is that besides being lighter and less bulky, there isn't any flap to contend with. You can have the zipper partially open, reach inside, and pull mags out with ease, just by feel. Mesh Pockets - On the inside of the front panel are three mesh pockets. The one on the left is a full 12" tall, and the ones on the right are 6" in height each. All are approximately 9" wide. The mesh is sewn baggy so that the pockets are not flat, but have volume to hold more items. Each has a zipper opening with short pull. When empty, the mesh pockets lay flat and don't take up any internal volume. Front Organizer Pockets - The TNT-EM has the same two front pockets that are on the TNT, only that they're swapped from left to right, and the ones on the TNT-EM are wider. Each pocket is 10" tall, 9" wide, and 2" deep. Both have two-way zippers which open 3/4 of the way down. This allows the pockets to open outwards almost completely but not all the way and have items fall out. The internal organizers are made of 420D nylon. Inside the front of each pocket are two staggered slot pockets. The taller one will fit a couple of DVD cases and the shorter one will fit CD cases. The tall slot pocket also fits two M4 30 round mags side by side and the short one fits two .308 magazines (since they're shorter). Looking at the front of the bag, the 'Admin' pocket on the right has a main slot pocket for PDA, notebooks etc, and sewn to its front is a slot for business cards, and three oversize pen loops. I was tired of puny pen loops that were too tight, so asked for larger ones that would accommodate Sharpies, markers or slim flashlights etc. Inside the left front pocket are two staggered slot pockets with elastic strap retention. The slots in the back are flat, and suitable for additional business cards. The pockets in front are pleated, and will expand to hold most cell phones for 'non-tactical' use. For 'tactical' use, they'll also fit two double-stack pistol magazines each. Hidden Passport Pockets - Underneath each of the two front pockets is a secret/concealed 'passport pocket'. They're basically for putting flat items like documents or maps that you don't want found if the bag is subjected to a cursory visual search. I say 'cursory' to be on the conservative side, but no one I have let examine the TNT bag in detail has ever noticed those compartments. But then, they weren't looking for something hidden. The openings to both pockets are velcro closed, and in between the front pockets. Under normal circumstances, the entrance is not visible. Since the hidden pockets on the TNT-EM are wider, I'm able to fit a handgun in there, even though it's a flat pocket. Shown below is a full-sized MP 9mm. So, even if someone discovers the pistol compartment on the front of the TNT-EM, it's unlikely that they'd find a handgun stashed in the hidden passport pocket. Carry Options - The TNT-EM can be carried by the low profile handles, over the shoulder, or 'back-pack' style. The carry handles are 1.5" webbing, and are short for the lowest profile possible. There is a padded velcro handle wrap for connecting the carry handles together if desired. The TNT-EM has six metal D-rings to provide multiple attach points for the shoulder strap (see photo below). Shoulder strap -The TNT-EM comes with new shoulder strap that is more heavily padded with 0.5" foam. It is lined with Drilex and comes with two metal HK snap hooks. The TNT-EM shoulder strap also incorporates the instant adjustment capability featured on the EMDOM Gunslinger Sling. The front portion allows the length of the shoulder strap to be adjusted instantly. There is a short 'Z-pull' sewn to a plastic slider. The Z-pull is pulled down to shorten the sling and up to lengthen it. The HK snap hooks allow the shoulder strap to be removed or released relatively quickly, but not so easily that someone else can do it. We chose not to make an SR buckle on the shoulder strap a standard feature for EDC in public because an SR buckle on the main strap can make it very easy for someone else to release the bag and run off with it. The 18"-long padded portion is 2" wide and the straps are 1" webbing with ITW ghillietex metal bar sliders. It's more comfortable than webbing-only straps, and with the fixed pad, there's no separate pad to slip and slide on the strap. It's also more low profile than most padded shoulder straps. I found that there was no reason to have 2" wide webbing for the entire strap - the 1" webbing gets in the way less and with over 1500 lbs of breaking strength, it's more than strong enough. The six metal D-ring attach points, gives the user a choice in where to attach the shoulder strap - at the rear, in the middle or at the front, or a combination. Attaching the shoulder strap to the rear D-rings allows the bag to sit against the body better than if they were attached to the sides/middle of the bag. This allows complete access to the main compartment without the compartment being pressed against the body and compressed, but some folks will like attaching the shoulder strap to the center so it's more 'balanced'. A removable waist strap is also included if the TNT-EM is to be used when riding a motorcycle or if additional stability is needed on the move. This is 1" webbing with a SR buckle, and attaches to the TNT-EM body with metal bar sliders that route through 1" tab loops on the body. The waist strap stows when not in use, and need not be removed under normal use. Back Pack straps -This is a new feature for the TNT-EM, which was suggested by the customer as a means of presenting a lower profile in narrow aisleways on aircraft. In addition to the waist strap common loop, there is an additional one located just below it. A metal D-ring is also sewn onto the bottom of the bag. These are attach points for the new low profile webbing back pack straps that come with the TNT-EM. The straps are made of 2" wide seat-belt type webbing with 1" webbing and a ladder lock sewn at the end for adjustment. At the top end of the back pack strap is a metal 3-bar slider, which attaches to the common loop in the same way the waist strap attaches. The bottom of the strap connects to the D-rings at the bottom of the bag with a plastic snap hook. The back pack straps are easily attached in detached in seconds, and stow easily inside the bag. Note that when switching from horizontal carry to back pack carry, contents inside the bag can shift, so organize and pack accordingly to accomodate both modes of carry. The original TNT Bag was designed around function first, looks second; and is intentionally non-descript. The TNT-EM is no different, and looks like a well-made piece of luggage. Being larger than the TNT, I feel that the EM is less suited for EDC (depending on your needs of course), and more suited to uses where the additional volume is needed. Range - The larger size of the TNT-EM enables it to carry quite a bit more gear and equipment. While the TNT made for a great small range bag to support one handgun and a rifle, the TNT-EM can carry two handguns in its pistol compartment, eliminating the need for bulky pistol cases. This leaves more room inside the bag for shooting accessories. Targets fit great in the laptop compartment. I've used the TNT-EM prototype on trips to the range and desert, and combined with my TNT GYM bags to hold my rifles, I can carry most of my ammunition, magazines and other shooting supplies. In the photo below on the left, an FN FAL para, AR15 and a folding stock AK plus magazines, ammunition and shooting equipment are carried discreetly in the three bags. One of the TNT GYM bags is the extended-length version, which is why it can fit the FAL para. Travel/ Bug Out Bag - This is where the TNT-EM shines; as a travel bag. Depending on how you pack, you can carry enough for a few days; all neatly organized within the bag's compartments and pockets. The new back pack straps really work well, and I actually prefer them to the shoulder strap. When worn on the back, it's possible to loosen the left strap and swing the whole bag around to the front, where the pockets and compartments can be accessed without removing the bag from the shoulder and setting it down; much like the Arc'Teryx Blade 21 Pack which has all the pocket openings on the side. As mentioned before, some thought needs to go into packing the TNT-EM if you're going to switch carry modes as items can shift and migrate. You obviously don't want to put small loose items in the side stash pockets, then carry the bag vertically. Larger items like canteens and water bottles will be securely retained in the side stash pockets in any mode, though. I also recommend ensuring that the zipper pulls are at the 'top' of the pockets in the back pack carry mode (the sides when the bag is horizontal). Worn on the back, the TNT-EM is unexpectedly comfortable and mobile - more so than wearing it horizontally over one shoulder, I found. It's also more stable and easier to maneuver. I also found this mode preferable when riding my motorcycle as there was no chance of it moving around to the front. The original TNT Bag was designed to meet the needs for an EDC bag with tactical features hidden inside a non-tactical exterior. With its larger size, the TNT-EM furthers the design philosophy behind the original TNT, while extending its capabilities with increased capacity and carry modes. Credit and thanks go to the original Army customer of the TNT-EM, for providing the input and requirements upon which the TNT-EM was designed to meet. For ordering info and a ton of other photos, visit EMDOM USA's TNT-EM Bag page.